The Dress Shop of Dreams is a novel in the genre of literary fiction, primarily taking place in Cambridge and Oxford. 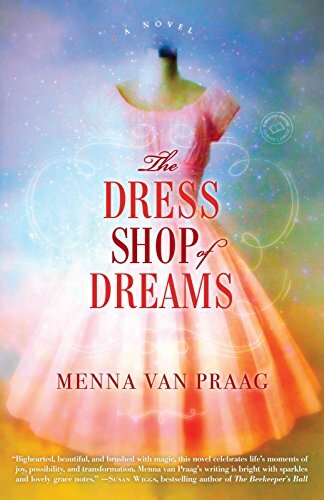 The Dress Shop of Dreams relays the story of a Cora, a scientist out to make a difference in the world, who is also the granddaughter of Etta, the dressmaker. Van Praag stitches together the interwoven lives with the rest of the characters, who each earn their spot in the novel with their own compelling tales. Cora is locked emotionally and physically in her scientific world while Etta stitches magical dresses and gowns in her shop, A Stitch in Time. On the same strip called All Saints' Passage is a bookshop, Blue Water Books, owned and operated by the humblest of characters, Walt. His timid and unrequited love for Cora becomes the core of the story. With depth surrounding the character's dilemmas, Cora shuns even the idea of love, Etta holds close in memory the one man who ever captured her heart, the one who got away, and Walt seeks the bravery he needs to face his biggest confession. At the same time, Etta's dresses bring wisdom and powerful intuition to all who wear them. The gowns have a magical way of enticing confidence in the women who step through the door of A Stitch in Time and into their perfect bespoke dresses. Each couture experience, however, begs the question: Is it enough? Van Praag has a deliciously innate capability to weave the totality of characters of The Dress Shop of Dreams into a compelling tale. Each character, from Cambridge to Oxford, augments and refines these dynamics. Ultimately, van Praag cracks the code that deciphers magical fate when it comes to couture and the complexities of love. Heather Hummel has penned more than a dozen books as a ghost author. Media coverage of these releases include Publishers Weekly, USA Today, the Washington Post and various magazines with a combined print circulation of more than 20 million. She is also a regular contributor to the Arts and Culture section of Huffington Post.